The Baltimore Needlework Market had come and gone. It feels like Barb and I work like crazy to have new patterns ready for a market....and 15 minutes later it's over. We look at each other and think, "Now should we do?" Barb didn't go with me to this market as she is trying to finish the remodel job on her home. Then to top it off, she came down with a pretty nasty respiratory virus. She's still coughing one week later. We are all glad that she stayed home. There's no sense in passing all of those germs around to our friends. But I missed her company and funny comments at market. Barb has the best sense of humor. My husband Dave went with me to this market. He turned out to be great help. We were able to combine this trip with a visit to our son who lives in Washington, D.C. I never thought of market as a vacation time....mostly because the van is loaded with patterns and furniture and we have work on our mind. But now, I'm rethinking this whole notion. I'd never been to Baltimore before. Dave and I enjoyed riding the light rail downtown to the Inner Harbor after our booth was set up. It was a fun location to grab a bite to eat and watch the people walking around the harbor. We also went to Annapolis and visited some shops. It was parent's weekend and the new cadets from the Navel Academy were in their dress uniforms showing their families around. We had a bit of lunch at Reynold's Tavern. Great place to eat and the food was lovely. Thanks to all of you who visited our booth at the needlework market! Barb and I are now busy thinking about quilts for the Houston fall market. We are working on a book using our new fabric line Blueberry Crumb Cake by Moda fabrics. Two new show and tell items! Nancy Frisch sent us pictures of her Trick or Treat quilt from When The Cold Wind Blows. She writes, "I am thrilled to tell you that I won 1st prize at our Truckee Meadows annual quilt show with your Trick or Treat quilt design. It has been a pleasure to hand applique all those baskets and then when I completed the top it was too big for my sewing machine! I had to hand quilt the whole thing! Please note I opted for yo-yos in the border triangles -it seemed an appropriate alternative. This is my first time receiving such an honor and I wanted to share it with you. This is a wonderful design! Thank you for all you do! Nanci Allen Bowen sent the above picture and writes, "I used to own Fiddlesticks Quilts here in Boulder City, Nevada, and I’ve met you both and spoken with you several times at past Quilt Markets. I sold my shop 6 years ago when I needed a fulltime job with the basic benefits (life change event) and at times even wondered if I would sew again and make another quilt. I didn’t want to lose my creativity and inspiration so I tried to keep my hands busy. I kept my pattern company (Fiddle-Dee-Dee Designs) and have published a few designs. My friend Sally (who used to attend Markets with me and has met you too) took this photo yesterday and we thought it might make you smile. So thank you for your creativity and inspiration! I miss my shop and keeping up with the latest fabric and patterns, but I did find your blog and hope to follow along with your inspiration. Thanks so much! Well....that's all the news for now. I'm off to clean the studio and get out the fabric! Love the new patterns. Can't wait to get them and start stitching. Love Halloween Eve and Casting a Spell...they are both in my bag at my LNS awaiting pick up! Now I have to go in the other direction to Hobby Lobby to get the shadow box, or whatever that is got the Spell. Very cute. I have finished stitching LF Summer, part one, and should finish up Woodland Berries tomorrow, love those. Can't wait for part two! I hope Barb is feeling better. Also looking forward to some Blueberry Crumb Cake some cold autumn morning in upcoming months. I love your new patterns ~ I bought everything I need for Morning Star except I cannot find the box ~ I went to 2 Hobby Lobbys and also tried to order online but no luck. Any ideas? 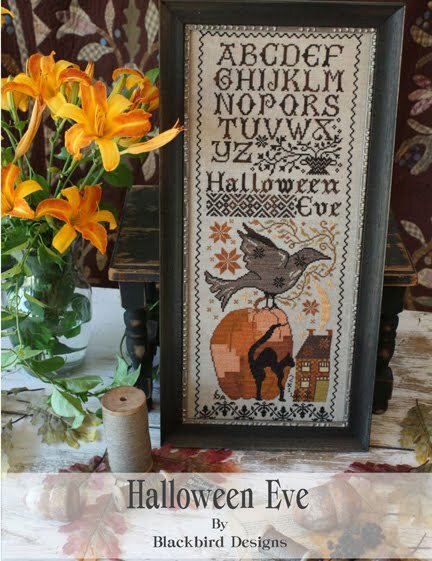 Love the new patterns and the lettering you used, perfect for fall. Great show and tell, both beautiful pieces. Look forward to your new Blueberry Crumb Cake book! Awesome, as always. I am so addicted to BBD! Your new designs are wonderful, as always. Loved seeing pics of the quilts too. Love the new patterns. Thanks for sharing! Love the new patterns!! Looking forward to stitching them soon. I love the new charts- Casting a Spell is a MUST! Also love Morning Star, but can't find the paper mache box on the Hobby Lobby website anywhere. Could you please tell me where you found the paper mache box with the cylinders. I love your blog - the photos are always so beautiful. 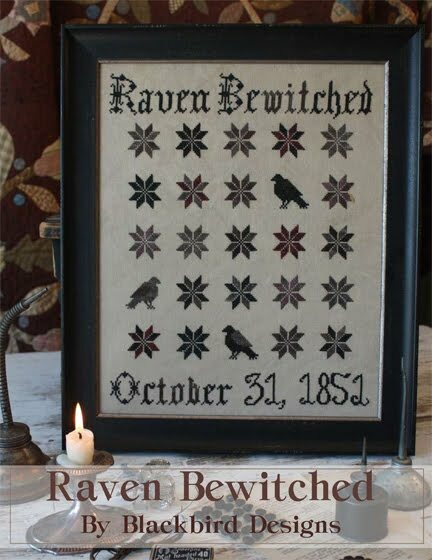 i just bought the new halloween cross stitch patterns, cant wait to get them!!!!! Your new Halloween patterns are wonderful! How nice to see a blue ribbon on one of your quilt designs. Lovely Alma! I am also wanting to get the box with the cylinders... Thanks! Ready to stitch these new patterns. I was looking for an old loose feathers pattern. But 2008 is ages now !!!! So I was wondering, have you thought about a collector book where old loose feathers could be found? I am sure you have already thought about it !! The paper mache box with cylinders can be found at Hobby Lobby. If you can't find it there I know that The Attic Needlework in Mesa, AZ has some. If you have a cross stitch shop and are carrying the boxes please let us know here too so I can include you! What about the box used for Casting A Spell? I've checked Hobby Lobby's website and don't see anything there like it. I NEED TO HAVE IT.....please help. 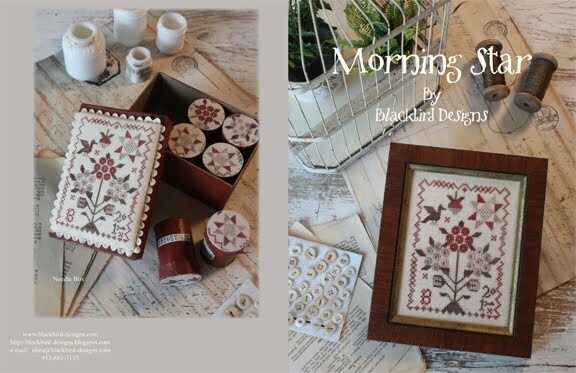 Thanks for all your wonderful cross stitch and quilt patterns. Always so unique and you offer such creative ways to finish them. Some wonderful designs like all we see in this blog. Greetings very loving from the Canary Islands. I've posted in my own blog a wonderful design. Thank you for designing such wonders. A stalwart of his work. The box is hard to find on Hobby Lobby's web site. I think their site is a bit confusing to navigate at first. Take a look under "crafts", then "medium wood" then click on "household". It's the glass covered shadow box. OMG!! I already have one. Sorry to say, my stash of unfinished wood pieces is getting almost as extensive as my fabric stash!! How embarrassing is that now. Now, all I have to do is wait for my local shop to get your patterns in. Thanks, Alma!! PS Hope you're enjoying your 'extra' time off this year. Keep those ideas coming. I love them all. I was able to find the Casting a Spell box by putting the sku number in to the Hobby Lobby website. When I put in the number for the Morning Star box, I got a bead. I am wondering if the item number is just printed incorrectly which is why we can't find it. 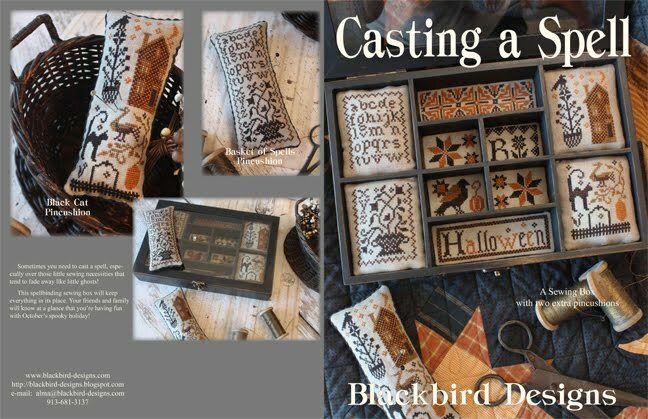 On another note, out at the Hobby Lobby site, the Casting A Spell box is shown as a "Bestseller"!! Wonder why??!!!! 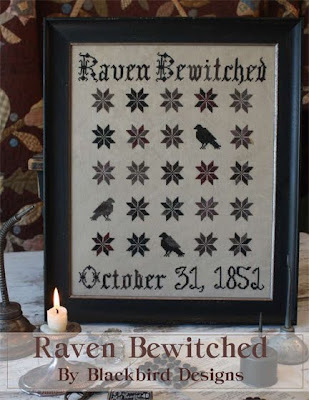 I fell in love at first sight with Raven Bewitched and am going to start on it this very week. However, will you tell me why you picked Year 1851 - any particular reason ? Thank you for letting me know ! 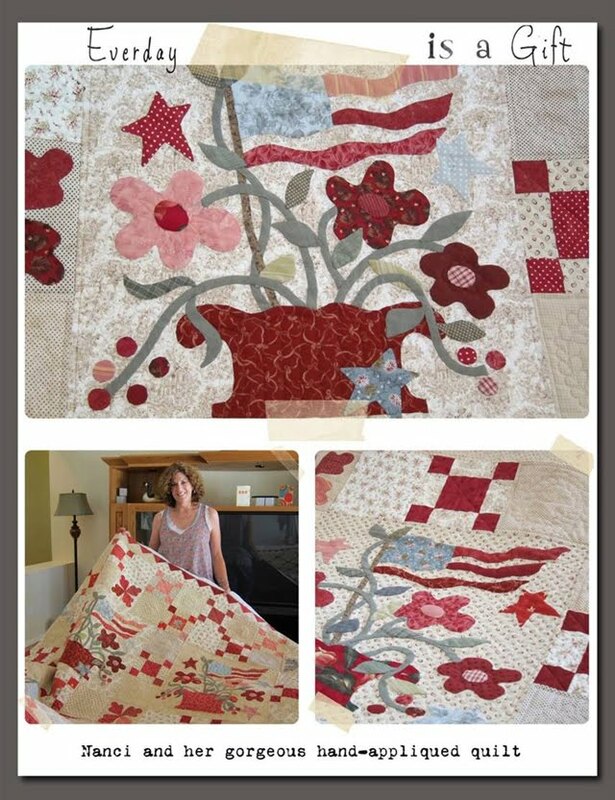 And as usual, congratulations for your creativity and sharing it with us stitchers and quilters. I love the new patterns - all of them. I am starting Casting a Spell first and hope to get it done for Halloween. BTW - it was a bugger to figure out how much fabric for all the pieces. Could you include a layout next time? Alma, you had left me a reply on the quilt that Nanci Bowen had made in the August '11 blog that you were'nt able to find which book you & Barb had designed. It would have been around 2005 or earlier so could you please, please check again? Providing quality needlework supplies and personalized customer service since 2000. When I found this quilt in your book, I decided this would make a good learning project. Several copies were made of this piece to cover the box lids. I didn’t want to lose my creativity and inspiration so I tried to keep my hands busy. There's no sense in passing all of those germs around to our friends. This is a wonderful design! Thank you for all you do! Thanks for sharing your happiness in doing your art. I decided this would make a good learning project.